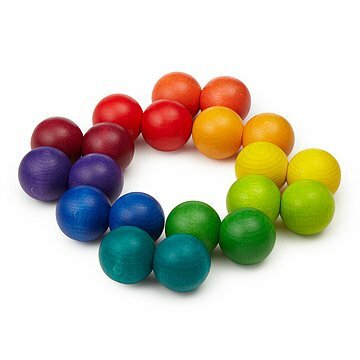 The classic stress ball comes full spectrum with this vibrant, colorful set of twenty wooden balls. Specially designed connectors enable interconnected balls to be easily turned and twisted into your own creative designs. Pop the colored orbs into a 3D circle in rainbow order, construct a pyramid ascending from cool to warm, or just roll the balls into amorphous blobs to melt away the tension. The fabulous color finishes on these finely sanded balls blend beautifully with the natural wood pattern underneath, enhancing all your soothing arrangements. Designed by Bernd Liebert in Germany. Manufactured in Taiwan using FSC-certified beechwood from Italy. To see this Playable Art Ball in action please click here. Non-toxic, water-based paint from Germany. Connected by phthalate-free, durable POM plastics from Taiwan. i saw this product on TV and searched around for it. Its a great stress reliever and a conversation piece. I am on conference most of the day and this sits on my desk to help me stay focused on the conversation and off my computer. Beautifully made and very cool to play with! We distribute wooden childrens furniture from Germany, and were looking for a unique gift to send to our reps for te holiday. This spoke to a classic design, a fun puzzle, and has the same colors as our comany logo! Everyone loved it! Since it was shipped as gift, I didn't get to see it but picture online looked great, so I ordered with confidence. I have it in my office for psychotherapeutic use. Bought as a gift/surprise and sent to my son at college. He and his roommates love them! Great for a break from studying. This product arrived and was carefully wrapped. All was good! Got this for accountant son for his office. They look to be nice and are pretty colors. These are a Christmas gift to him. I bought these for myself. I spend hours on the phone for my job. I was looking for something to play with while talking on the phone - something that would not steal my attention or concentration, but would give me something to do with my hands. These are great. I love the rainbow colors. They are a little bigger than I expected but no complaints. My kids who are teenage boys have been playing with them too. Fun for all ages. Fun...but also great for taking a break from a stressful day.....its in my office with me.